A BioBlitz is a field biodiversity survey to record all the living species within a designated area, usually over a short period of time. 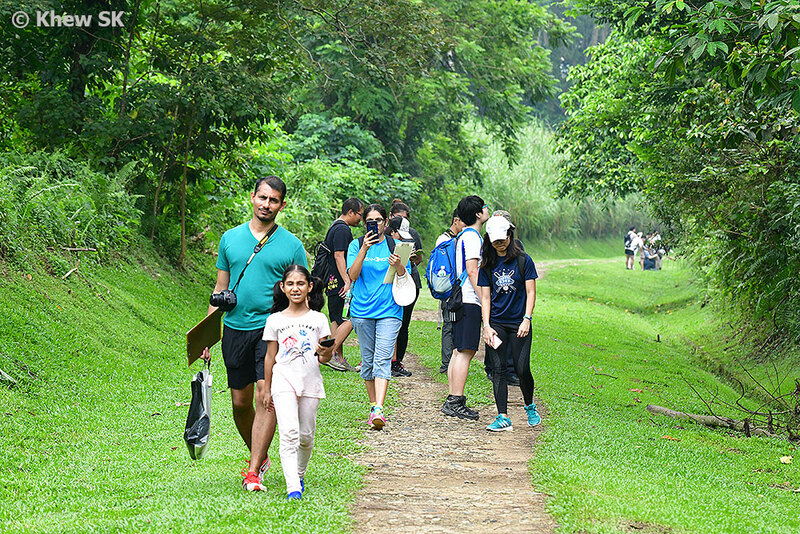 Groups of trained scientists, naturalists, volunteers and members of the public conduct an intensive field study over a continuous time period - ranging from 24 hours to a week. The public component to many BioBlitzes is to encourage the 'unconverted' to participate in these biodiversity surveys and to cultivate an appreciation and respect for nature. The term “BioBlitz” was coined by Susan Rudy, a naturalist with the US National Park service, in 1996. 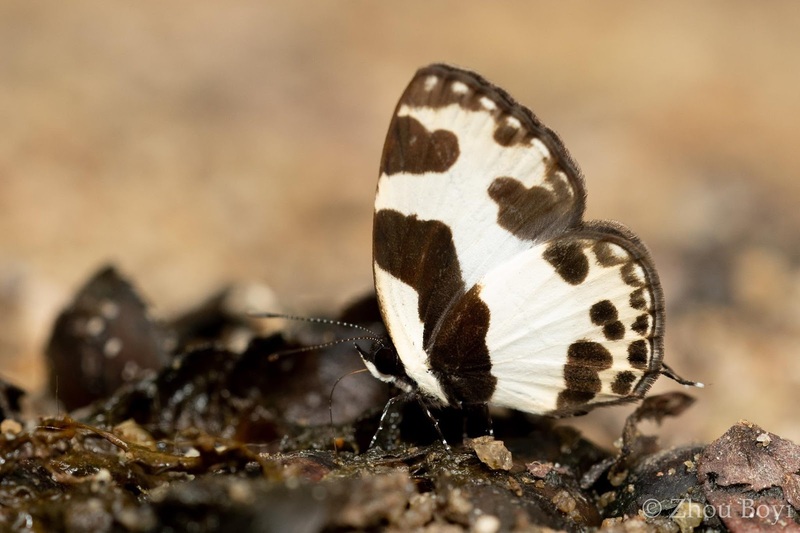 A BioBlitz refers to a concerted effort by scientists and the community to record as many species of flora and fauna as possible within a specific location and timeframe. The initiative caught on, and today, BioBlitzes have been conducted around the world, including the United Kingdom, Canada, Australia, Hong Kong, Malaysia and Singapore. Many BioBlitzes are conducted in urban and easily accessible areas to encourage the public to spot and identify the local biodiversity around them, literally in their "own backyards". 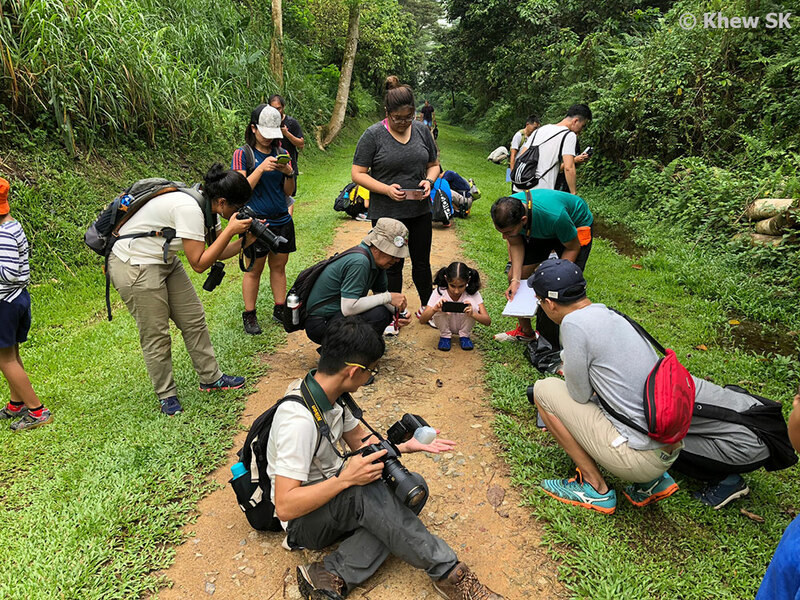 In Singapore, the NParks-Community In Nature BioBlitz surveys provide a unique opportunity for the community to learn from taxonomic experts, with the hope that such programmes will encourage stewardship of biodiversity amongst Singaporeans. The first BioBlitz surveys were started in 2016 at Pasir Ris Park and Pulau Ubin and in 2017 at Kent Ridge Park. 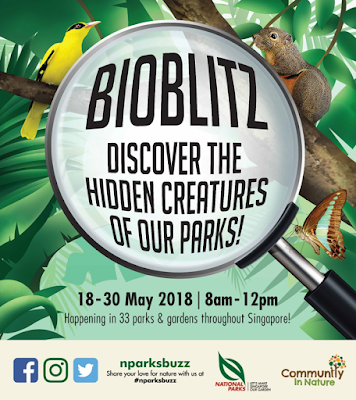 NParks conducted its first nationwide BioBlitz programme over the course of seven days as part of the annual Biodiversity Week (20 to 28 May 2017). 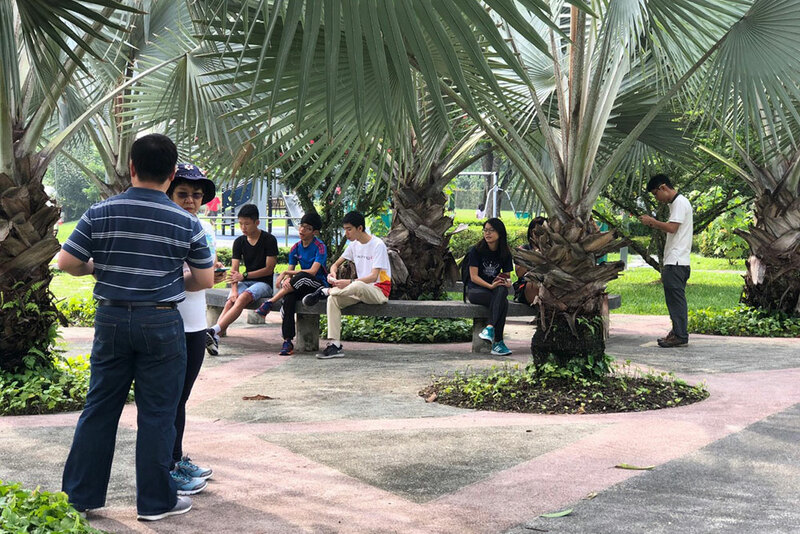 The Nationwide BioBlitz, the first of its kind on such a scale in Singapore, took place across around 90 sites in schools, parks, and gardens from 20 to 26 May 2017. 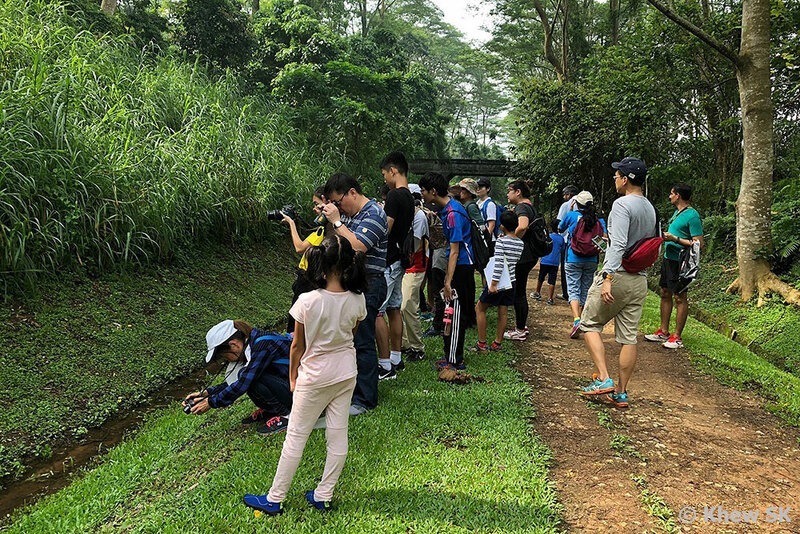 In 2018, NParks organised a suite of events and activities during Biodiversity Week (18 May to 3 June) to encourage the community to explore and encounter nature in Singapore. These programmes took place in schools, urban parks, gardens and nature areas, and involve partners from schools, research institutions, and nature-interest groups. The Nationwide BioBlitz surveys involved over 3300 citizen scientists surveyed around 80 sites across Singapore, including parks, gardens, nature areas and schools, and also for the first time, covered both terrestrial and marine sites. 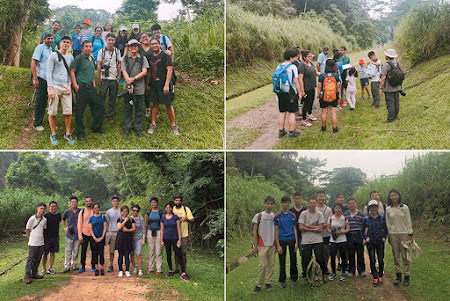 As part of the Nationwide BioBlitz week, which covered biodiversity surveys over no fewer that 33 parks and gardens in Singapore, ButterflyCircle members led a survey over a short stretch of the Rail Corridor starting at the Rail Mall. Concurrently, there were surveys on birds and dragonflies over the same stretch. 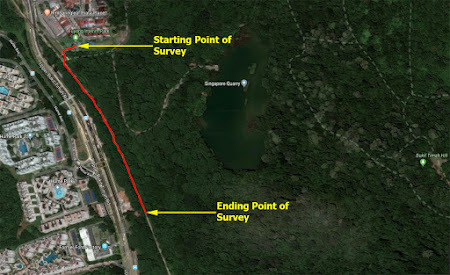 Our butterfly survey took slightly over 3 hours and we recorded a total of 28 species of butterflies over that short stretch of the Rail Corridor. After a quick briefing, the group was all set to start the survey! The BioBlitz survey started at around 8:20am when the group of participants were assembled and all ready to go. 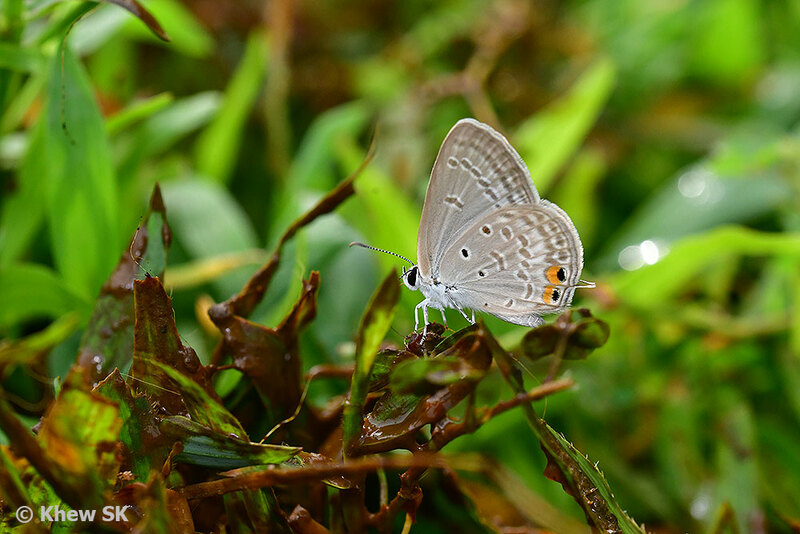 Our group of 16, inclusive of 3 BC members and Boyi from NParks, started on the transect in rather cloudy weather and commenced counting all the butterflies that we were able to spot. 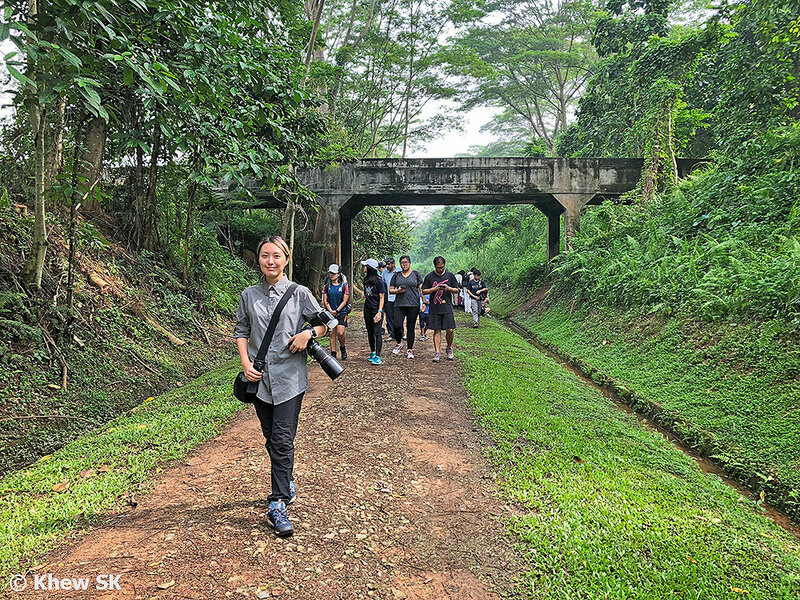 The stretch of the Rail Corridor can be considered quite 'green' and rich with biodiversity. The survey trail is immediately adjacent to the Bukit Timah Nature Reserve, which is a good catchment for butterflies and other animals. 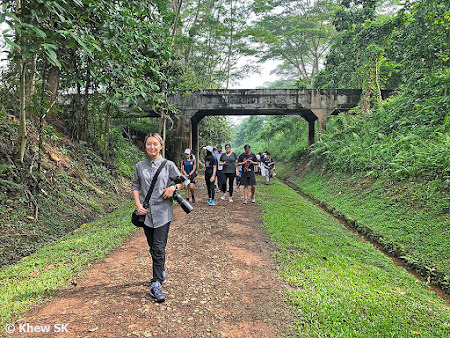 The trail is flanked on the western boundary by Upper Bukit Timah Road. 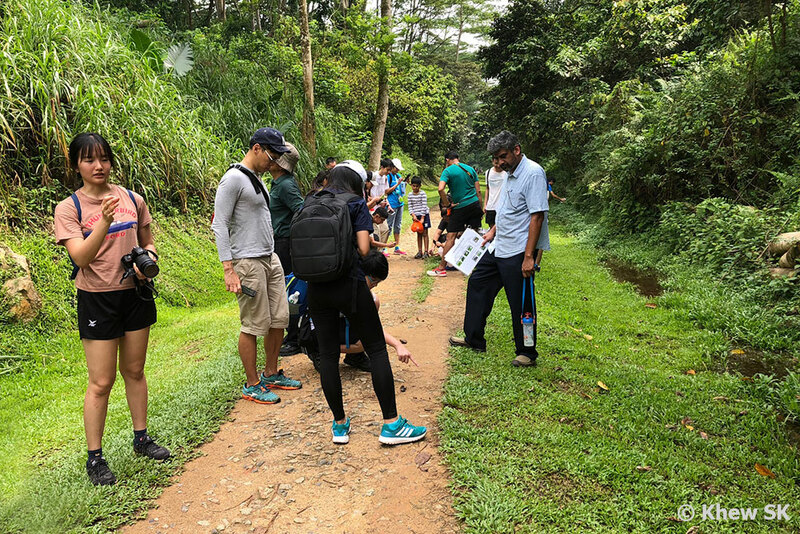 A small stream alongside the trail provided the humidity and water habitat for other organisms like dragonflies, fishes and frogs. 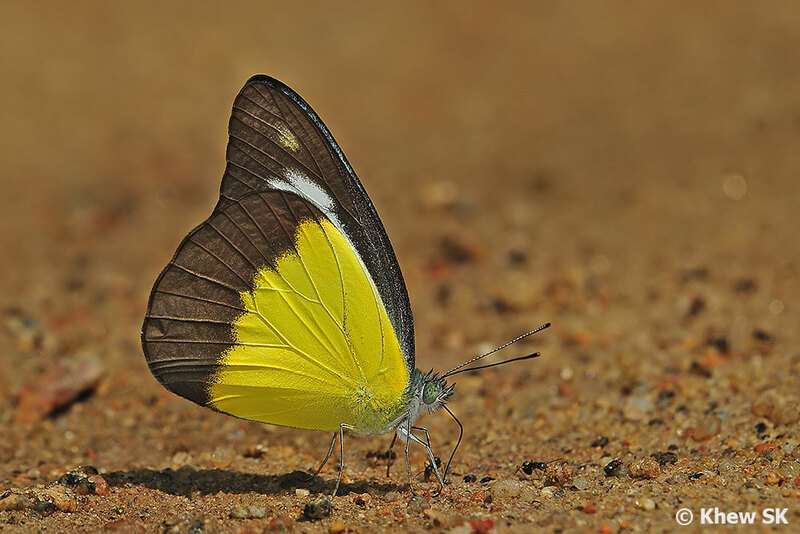 Along the main trail, the botanical diversity in terms of low bushes, wildflowers and host plants provided enough habitats for butterflies to flutter around in search of food. Parts of the footpath were open sandy and damp areas for some butterflies to puddle in search of various chemicals for nutrition and specific physiological and biological functions that they need these active ingredients for. 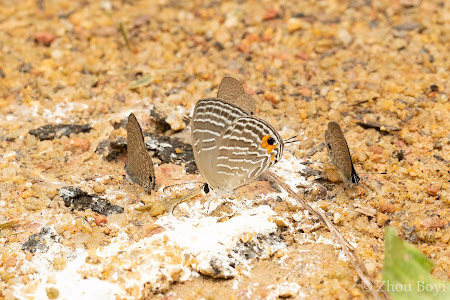 Indeed, the group encountered several species of Lycaenids puddling at certain sandy spots. Several of these species were cooperative enough to even allow handphone shots of them. An interesting sighting was the Chocolate Albatross (Appias lyncida vasava) a seasonal migrant that usually appears during the months of March to May when the species is abundant up north in Malaysia. A male was spotted flying along the survey trail. It was an enjoyable outing, keeping a sharp eye out for butterflies and sharing useful information about butterflies' behaviour, the way they fly, and tips on how to ID them. Members of the public, including young children were enthusiastic and learned fast. Boyi created some visual checklists to help the volunteers ID the common species that can be found in urban parks and gardens. 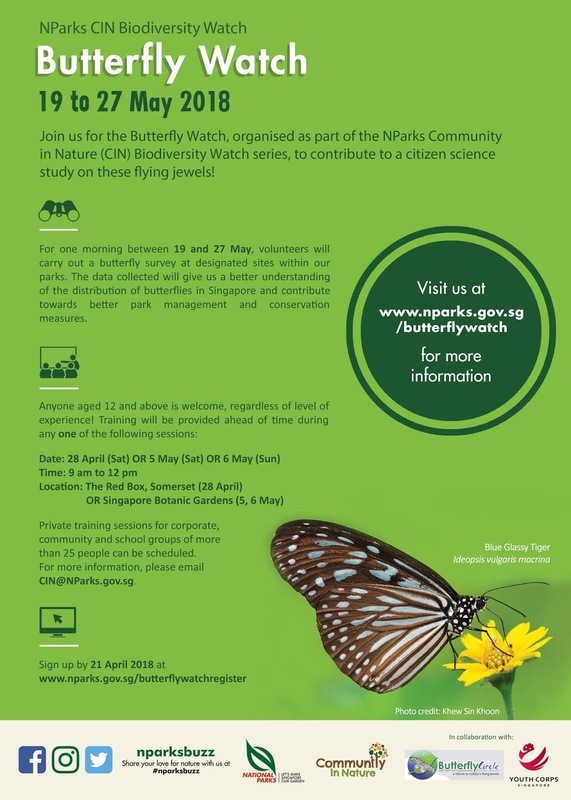 A dedicated Butterfly Watch programme is also available for those who prefer to just record butterfly sightings in various nature areas in Singapore. 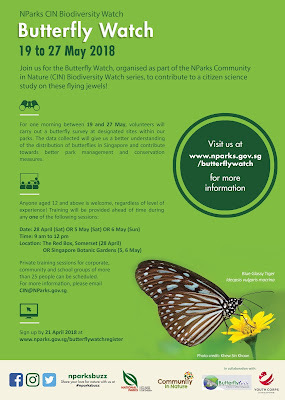 The Butterfly Watch is a citizen science initiative, organised by NParks in collaboration with ButterflyCircle, to get Singaporeans involved in collecting valuable information about the butterflies in our parks and gardens. With the data collected from many survey transects from the various parks around Singapore, the information will contribute towards better park management and conservation measures. 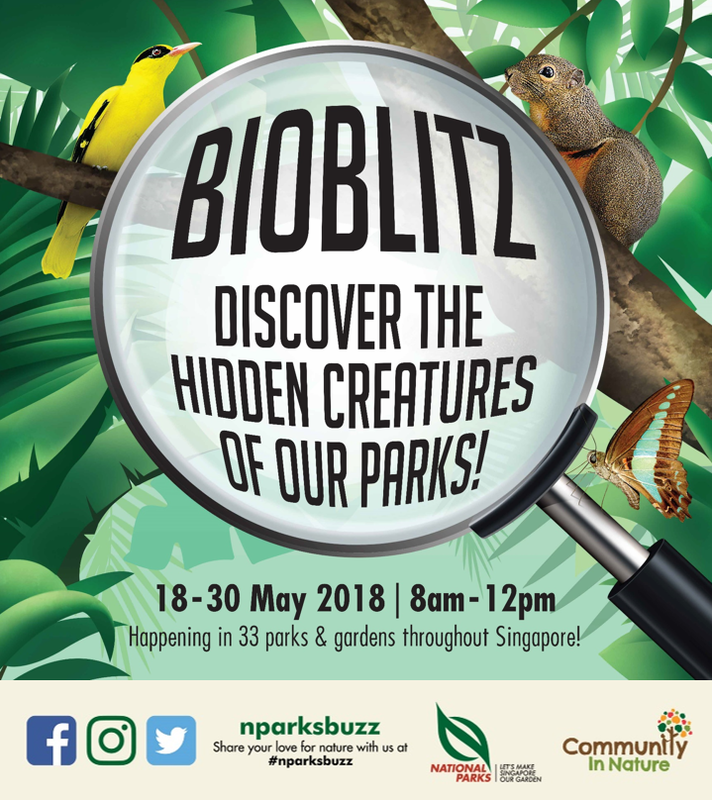 So if you're passionate about nature and butterfly watching, do look out for the announcements on the NParks' Community In Nature initiatives like BioBlitz and Butterfly Watch and contribute to the conservation and protection of our natural heritage in Singapore! Text by Khew SK and Zhou Boyi ; Photos by Huang CJ, Khew SK and Zhou Boyi.